This could be because when I was in High School, Newsies indicated that we had a substitute teacher in Choir, and I was going to be able to start on my 4-6 hours of homework a little early. It could also be because now is the time to seize the day. Your choice. 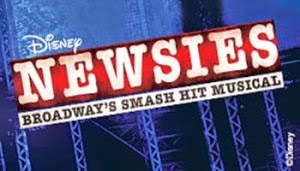 Whether you think it’s a Fine Life, or you’d like to be King of New York- Newsies is a great musical with a fantastic message! Want to go? I’ve got a pair of tickets to give away to the June 10th show! Visit my facebook page for details on how to win! As with all of our giveaways, prize is provided by the sponsoring organization, and our giveaway rules apply.